Ceiling hung football goal posts for indoor practice facilities. Allows kickers to practice indoors, or for use during indoor scrimmages. Material sizes are the same as found on high end outdoor goal posts. Crossbar is 6-5/8" O.D. Aluminum tubing by 18'-6" wide. Uprights are made from 4" O.D. Aluminum tubing, and measure 30 feet tall. Comes with a leveling feature to ensure the crossbar is level. Powder coated yellow. Suspended directly beneath the building structure, attaches directly to rigid frame girders, building trusses, I-beams or roof purlins. Comes complete with all attachment and suspension hardware. 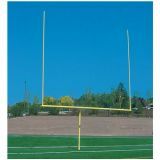 H-style goal post meets official NFHS specifications. Constructed with heavy wall 4" O.D tubing. 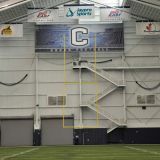 Measures 23' 4" W x 20' H. Uprights extend 10' above crossbar. Goal is powder coated white. Designed for permanent installation. Make life easier with this adjustable ground sleeve. Get the perfect alignment with a simple tweak rather than starting from scratch. For 4-1/2" diameter goosenecks. Zinc and powder coated steel goosenecks available in 5-9/16" with 6' offset. 20' high 2-3/8" top aluminum uprights.23' 4" W crossbar. Fully adjustable in 2 directions ensuring the crossbar and uprights are level and plumb. Adjustable leveling plate installation. Yellow finish. Meets NFHS specifications. 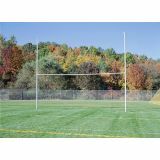 Collegiate goal posts also available, please call or visit our website for details. Zinc and powder coated steel goosenecks available in 4-1/2" with 5' offset. 20' high 2-3/8" top aluminum uprights. 23' 4" W crossbar. Fully adjustable in 2 directions ensuring the crossbar and uprights are level and plumb. Adjustable leveling plate installation. Yellow finish. Meets NFHS specifications. 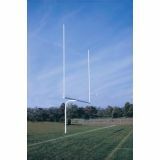 Collegiate goal posts also available, please call or visit our website for details. Zinc and powder coated steel goosenecks available in 4-1/2" with 5' offset. 20' high 2-3/8" top aluminum uprights. 23' 4" W crossbar. 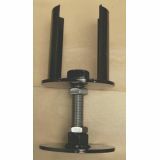 Fully adjustable in 2 directions ensuring the crossbar and uprights are level and plumb. Permanent installation. Ground sleeves available separately for semi-permanent installation. Yellow finish. Meets NFHS specifications. 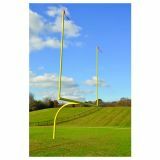 Collegiate goal posts also available, please call or visit our website for details. Zinc and powder coated steel goosenecks available in 5-9/16" with 6' offset. 20' high 2-3/8" top aluminum uprights. 23' 4" W crossbar. Fully adjustable in 2 directions ensuring the crossbar and uprights are level and plumb. Permanent installation. Ground sleeves available separately for semi-permanent installation. Yellow finish. Meets NFHS specifications. 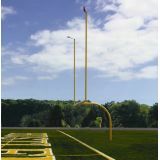 Collegiate goal posts also available, please call or visit our website for details. Telescoping design allows crossbar width to adjust for official High School use at 23' 4" and College use at 18' 6". Anti-rotation feature holds upright in place allowing one person to adjust. All aluminum construction. 6-5/8" crossbar and gooseneck available with 6' offset. 4" top uprights, 20' in height. Fully adjustable in 2 directions ensuring the crossbar and uprights are level and plumb. Adjustable leveling plate installation. Yellow finish. Meets NFHS and NCAA specifications. Telescoping design allows crossbar width to adjust for official High School use at 23' 4" and College use at 18' 6". Anti-rotation feature holds upright in place allowing one person to adjust. All aluminum construction. 6-5/8" crossbar and gooseneck available with 8' offset. 4" top uprights, 20' in height. Fully adjustable in 2 directions ensuring the crossbar and uprights are level and plumb. Adjustable leveling plate installation. The 8' gooseneck model used with our adjustable rear crossbar soccer goals is ideal for multi-purpose facilities. Yellow finish. Meets NFHS and NCAA specifications. Telescoping design allows crossbar width to adjust for official High School use at 23' 4" and College use at 18' 6". Anti-rotation feature holds upright in place allowing one person to adjust. All aluminum construction. 6-5/8" crossbar and gooseneck available with 6' offset. 4" top uprights, 20' in height. Fully adjustable in 2 directions ensuring the crossbar and uprights are level and plumb. Permanent installation. Ground sleeves available separately for semi-permanent installation. Yellow finish. Meets NFHS and NCAA specifications. Telescoping design allows crossbar width to adjust for official High School use at 23' 4" and College use at 18' 6". Anti-rotation feature holds upright in place allowing one person to adjust. All aluminum construction. 6-5/8" crossbar and gooseneck available with 8' offset. 4" top uprights, 20' in height. Fully adjustable in 2 directions ensuring the crossbar and uprights are level and plumb. Permanent installation. Ground sleeves available separately for semi-permanent installation. The 8' gooseneck model used with our adjustable rear crossbar soccer goals is ideal for multi-purpose facilities. Yellow finish. Meets NFHS and NCAA specifications. All aluminum construction. 6-5/8" crossbar and gooseneck available with 6' offset. 4" top uprights, 20' in height. 23' 4" W crossbar. Fully adjustable in 2 directions ensuring the crossbar and uprights are level and plumb. Adjustable leveling plate installation. Yellow finish. Meets NFHS specifications.